We are honoured to introduce to you our new series of interviews featuring LinKS Alumni. The interviews have been conducted by Elisabeth Geday, DR’s Communication and HR Executive Director. 00:00 – 02:23 What are your most significant challenges and what are your strategies to address those challenges? 02:24 – 04:10 What did you learn from the LinKS@Wharton program? 04:11 – 08:36 What has been your biggest change in mental models since you were at Wharton? Interview with Morten Kjærum, current Head of the Raoul Wallenberg Institute of Human Rights and Humanitarian Law in Sweden (former first Director of the European Union Agency for Fundamental Rights (FRA) ) and founding Director of the Danish Institute for Human Rights) about his projects and experience at LinKS@Wharton. 01:32 – 02:29 What are Morten’s most significant challenges and what strategies is he using to address these challenges? The second interview with LinKS Alumni, is featuring Thorkil K. Christensen, CFO at Novo A/S. 00:42 – 03:34 What are your challenges in your business life? 03:35 – 05:14 What has been your biggest change in mental model since Wharton? 05:15 – 09:17 What are the next and most innovative steps you are going to take in the future? 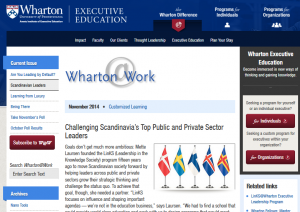 As a follow-up of the LinKSlabs @ Wharton G2, Wharton @ Work online magazine published an article on our activity. We are impressed with the article and grateful for the flattering mention!